Posted by Brittany Bosher on Tuesday, August 25th, 2015 at 1:06pm. The Riverwalk Café and Oyster Bar is located at 201 S.W. St. Lucie Avenue, Stuart, FL 34994. To contact the Riverwalk Café and Oyster Bar please call (772) 221-1511. Spoto’s Oyster Bar is one of south Florida’s premier, traditional raw bars. Spotto’s offers two locations, Palm Beach Gardens and Stuart. The Spoto’s Oyster Bar of Stuart is located directly on the wide-open water of the St. Lucie River. Spoto's serves fresh-shucked, cold water, Blue Point Oysters, steamed Littleneck Clams from the cold, unspoiled waters off Cape Cod, and their signature famed Oyster Stew and they even serve a special Bouillabaisse. Once you have visited Spoto’s of Stuart you will understand why it is such a beloved restaurant in Stuart. The ambiance of the restaurant is warm and welcoming with panoramic views of the water. A sunset dinner will take your breath away and the fare served by Spoto’s will be even more memorable. 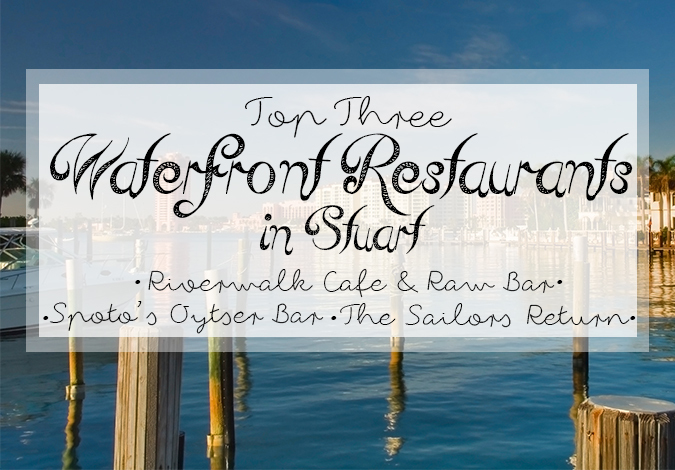 Spoto’s Oyster Bar Stuart is located at 131 SW Flagler Avenue, Stuart, Florida 34994. To contact Spoto’s of Stuart please call 772-220-7772. Sailor’s Return is one of Stuart’s most famous restaurants and for good reason. Located on a beautiful marina off of the St. Lucie River, Sailor’s Return boasts some of the best views of Stuart. Sailor’s Return offers their guests “the casual elegant atmosphere of Sailor's Return is the perfect place to enjoy an exciting new dining experience in a one-of-a-kind tropical harbor setting.” The party doesn’t stop at this fun and tropical spot, you can enjoy live music weekly at Sailor’s Return and tons of special events. Not only are the views great at Sailor’s Return but so are the dishes and cocktails. A culinary delight inspired by cultures from around the world is what encompasses the menu at Sailor’s Return.